The wristwatch as we know it has been around for a little over 200 years, and while it appears little has changed over the two centuries, the Swiss watch industry has continually innovated. Yes, there’s still a strap that keeps it attached to your wrist, a face that tells the time and a piece of glass or crystal protecting everything. But behind the face there have been hand-wound movements, automatic movements, quartz movements and silicon chips. Fashions have changed over the years, but without doubt the largest innovations in the watch industry have been in aid of accuracy, reliability, and durability. While other watchmakers can lay claim to making the first dive watch, it was Rolex that made the world’s first waterproof watch. The Rolex Oyster was created in 1926, featuring a screw-down crown and screw-down case back (each of which were sealed with rubber gaskets) creating a hermetically-sealed case – making it the first truly waterproof and dustproof watch. In 1927, Rolex founder Hans Wilsdorf gave Mercedes Gleitze one of the earliest Rolex Oysters to wear on her attempt to repeat her swim across the English Channel. The watch survived the ice cold waters. After years of innovation, Rolex reached its pinnacle in 2012 with the Deepsea Challenge, an experimental divers’ watch that James Cameron took to the deepest point in the world’s oceans, 10,908 metres below sea level. The Seiko Quartz-Astron 35SQ, also known as the Astron, was the world's first quartz wristwatch. Now registered on the list of IEEE Milestones as a key advance in electrical engineering, the Astron was unveiled in Tokyo on 25 December 1969. The movement took 10 years to develop and included a hybrid integrated circuit, and a phase locked ultra-small stepping motor to turn its hands. Seiko claimed the Astron was accurate to +/- 5 seconds per month or one minute per year. The gold watches were sold for 450,000 yen, which, at the time, was the price of a medium-sized car. The Pulsar P1, released to the public on 4 April 1972, was a milestone in the history of timekeeping. It was the very first digital watch, relying on an electronic display instead of a mechanical mechanism. Not only was it the first digital watch, it was also one of the first consumer electronic products to use an integrated circuit – you know – a computer chip. Those things are very common nowadays. The chip was enclosed in a solid 18 karat gold case and had a time screen made from synthetic ruby. Only 400 units were made and each sold for $2,100 – quite a bit more than a car cost, at the time. The Swatch Sistem 51 was the world’s first mechanical movement with an automated assembly, meaning even watch enthusiasts on the strictest budgets could afford a Swiss-made automatic watch. The Sistem 51 is made from only 51 components, all of which are anchored to a central screw. The watch was released at Baselword 2013, with the aim to allow young people to enter the world of mechanical watches with an attractive and affordable watch, hoping they’d later graduate onto more expensive and luxurious mechanical watches. Magnetism is the enemy of all watch owners; it’s an invisible force that can destroy your timepiece, or, at the very least, affect the accuracy of your watch at some point. Now, most mechanical watches are somewhat anti-magnetic, and can resist around 90 Gauss, but the Omega Seamaster Aqua Terra > 15,000 Gauss, as the name suggests, can withstand a massive 15,000 Gauss. How is that possible? There’s no magnetic shield or anything like that, Omega has developed a movement that simply isn’t magnetic, using non-metallic and non-ferrous metal parts. The 15,000 Gauss represents a major step in the evolution of Omega timepieces, with all new pieces since 2014 featuring the anti-magnetic movement. 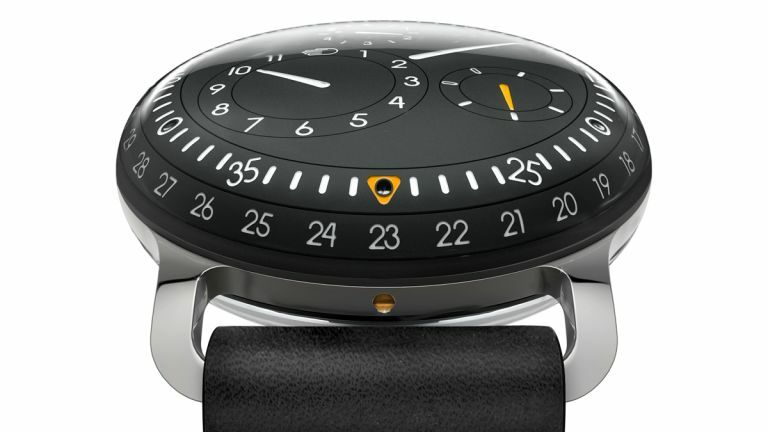 Ressence took to the SIHH 2018 stage earlier this year to unveil its latest innovation – the Type 2 e-Crown Concept. And, despite not being the first hybrid watch we've seen (far from it), it's certainly the most innovative, with a hope to "improve the mechanical watch of today by incorporating technologies of tomorrow". Rather than using the smartphone connection for activity tracking, the e-Crown showcases the tremendous potential of its automated time setting. You only need to set the time on your Type 2 e-Crown Concept once, via the lever on the case back, and you are ready to go. No need to think about setting or adjusting it any more; the watch and companion app does it automatically for you. While the Apple Watch wasn’t the first smartwatch, it has, by a country mile, been the most successful. Launched on 24 April 2015, it was the first smartwatch that appealed to mainstream consumers, in a way that Pebble and Android Wear didn't, and began seamlessly weaving itself into wearers' routines, giving them phone notifications on their wrist and recording their workouts. Three years on and the third generation of the Apple Watch is still ahead of the crowd, adding new features and functions, the largest of which is a cellular and GPS chip, allowing it to be used independently from your smartphone.